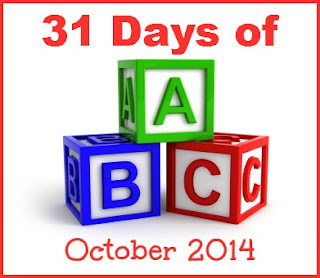 Disclosure: This post contains an affiliate link. If you click on it, and make a purchase I will receive a small monetary compensation. Working on a letter post has never been so exciting! 🙂 For the 31 Days of ABC hosted by All Done Monkey this year I chose the letter “T”. My child loves everything and anything trucks! 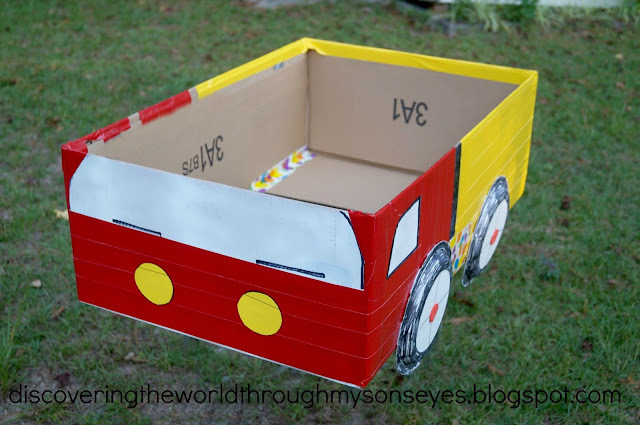 I even created a free printable Spanish activity for his favorite book: Demolición, and he also has his very own monster truck sensory bin. Now, this year for Halloween he wants to be a construction worker! He says that when he gets older that’s what he wants to be one so he can drive all of the trucks. Besides the goggles, vest, hard hat, and tools that he already has he needed a truck. 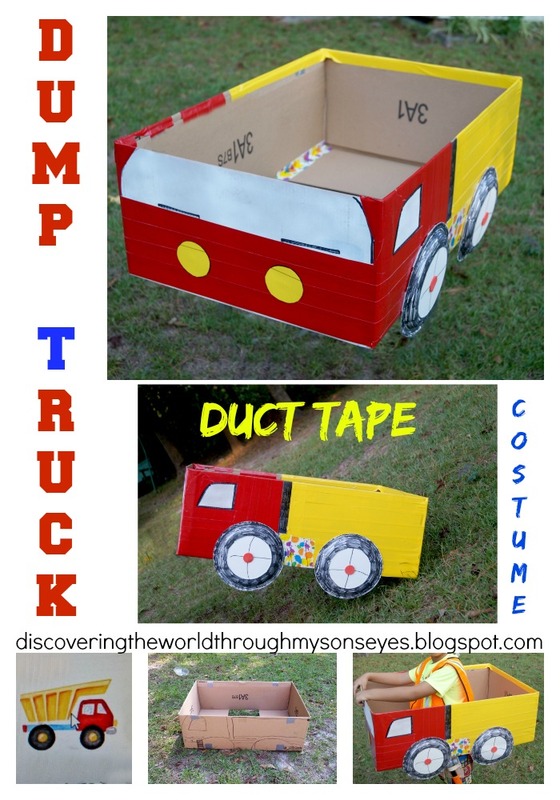 So I made a construction dump truck out of a large box, and used duct tape (instead of paint) to make it. I’m a very busy mom, I work full-time, and my free time well it really isn’t free! I thought of using tempera paint but that was going to be messy, and I needed to wait for it to dry. The spray paint didn’t work out as I hoped for. So, I ventured using the duct tape. I must say it was perfect! I used an empty box from an Amazon shipment, and drew the template of the truck over it. I used red, and yellow duct tape, and paper plates that he helped color with a black marker for the tires. Then I got to work with the duct tape. I have to admit it came out great, and my 6 yr. old L-O-V-E-S it! I also found this free truck puzzle application on Amazon. What a great idea to use duct tape. It looks great! And love your book list! 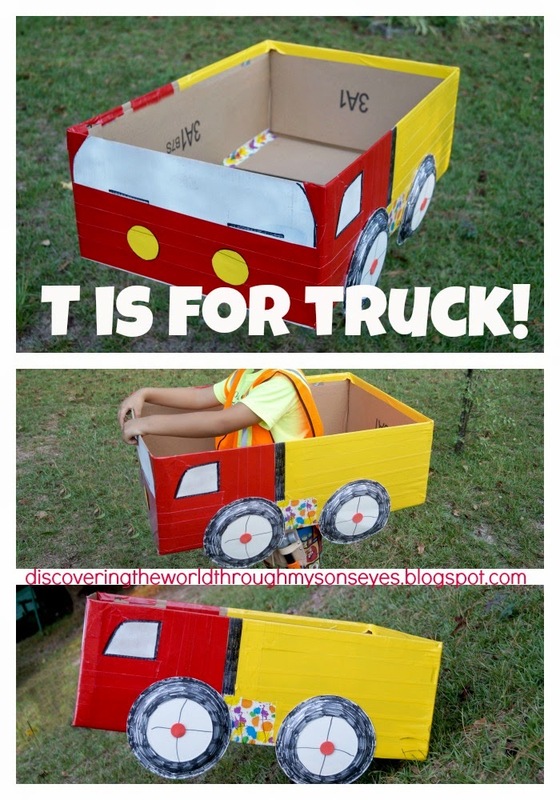 I love the bilingual book list – and that truck costume is AWESOME!